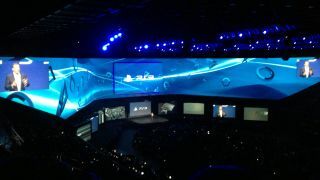 Sony took to the stage of its E3 keynote to fire off a gatling gun of new games for its upcoming PS4 console. Starting with an update on its PS3 and PSVita consoles before revealing the PS4 console itself, Sony then went on to show some off an army of titles for the next-gen console as well as a price-point well below the Xbox One. Beginning with The Order - 1886, a mysterious 1800s squad shooter from Ready at Dawn with a supernatural feel, the game tracks a male and female duo who travel through Victorian London to fight inhuman threats. Sony then gave a quick update to the key games shown off at the initial reveal earlier this year, with confirmation that Killzone: Shadow Fall and Knack will be available at launch, with Infamous: Second Sons launching Q1 next year. The old man floating head that made its appearance in February also returned, with a much more interactive video of The Dark Sorcerer. Sony promised a more detailed look at E3 tomorrow. The stage filled with indie developers all showcasing their unique titles for the upcoming platform. From a remake of the classic Abe's Odyssey called Oddworld: New and Tasty, to horror shooters like Outlast, space shooters like Galak-Z and other indies Secret Ponchos and Ray's Dead, Sony is offering plenty of variety in the indie space. This adds to the likes of The Witness, which was shown off in February, and the newly announced Transistor from Super Giant Games. Plenty of cross-platform games got stage time at the Sony PS4 conference as well, generally while announcing a small amount of unique content for Playstation gamers. Diablo 3, Assassin's Creed Black Flag and Watch Dogs were all shown off on the next-gen console, followed by The Elder Scrolls Online, NBA 2K14 and Mad Max. Bungie fans also got to see some gameplay of the upcoming Destiny, while Square Enix also took the time to show off some Final Fantasy XV and Kingdom Hearts III. It was a strong showing for Sony, although no game got anywhere near as big a cheer as when it was announced that there would be no used games DRM restrictions on the PS4 console.